With the withdrawal of the Vodapage paging system, 2018 has been a difficult time for the team in getting to callouts. The new system is based on either messages to mobiles (which can be difficult in the valley with its patchy mobile coverage) or the Airwave pager system. We have managed to acquire 2 extra Airwave pagers to add to our existing one and this has helped considerably. Nevertheless, our response to callouts has fallen short of the near 100% level which we had achieved prior to this. This will be an ongoing issue for some years before the new Emergency Services Network based on 4G mobile infrastructure is implemented. As part of this development, new communications masts will be required across the National Park, including our valley. We would encourage local residents to support their implementation, albeit sited and constructed with due regard to minimising environmental impacts. With a decline in the number of CFRs in the valley, we decided to install a 4th defibrillator in the valley at Waterend in Loweswater, which compliments the one installed in “central” Loweswater in 2017. It was again purchased through the Community Heartbeat Trust which also provides valuable management systems including insurance. We provided training to give locals confidence in using the defib at our annual “Coffee & Cake”morning in October. Having installed the two public access defibs in Butttermere and Loweswater over the last 2 years, we have now installed one in Lorton and this is located on the external wall of Lorton School. As with the Loweswater installation, this has been purchased through the Community Heartbeat Trust, a charity that specialises in providing defibrillators for public use. Like the defibs in both Butttermere and Loweswater, the unit can only be accessed once someone has rung 999 and been given the access code by the Ambulance Service. We have already carried out some training to give local people some confidence in using the defibrillator and doing CPR and hope to do this again in the near future. 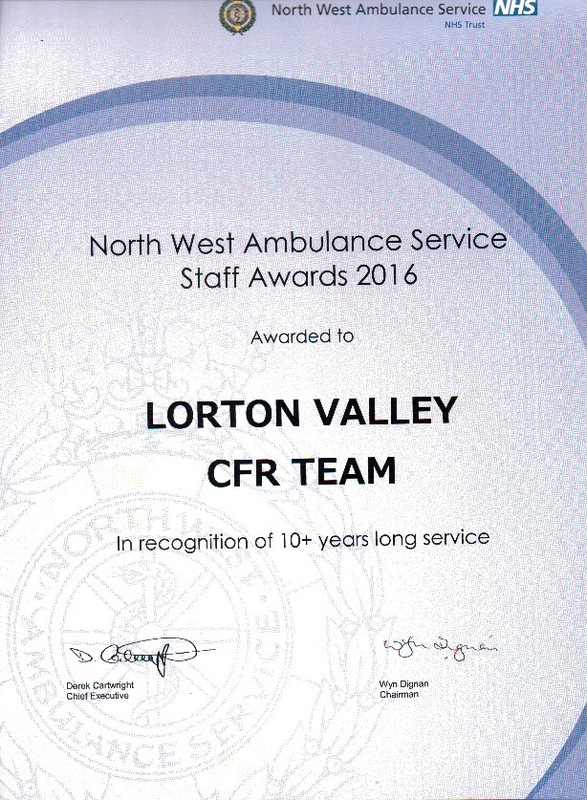 Our CFR Group has been running for over 10 years now and has just received a Long Service Award from the North West Ambulance Service (see below). Over the last year, we have been looking into becoming a charity and I am glad to be able to report that, although we were not able to become a Registered Charity with the Charity Commission (as our annual income was below the required threshold), we have been accepted as a “charity for tax purposes” by HMRC. Hopefully, everyone who is a tax-payer and donates to us in the future as an individual will be happy to complete the Gift Aid form and thereby boost our income by 25% (via the tax they would have already paid to HMRC and which is passed on to us). We have worked with The Community Heart Beat Trust, British Telecom and the installer, Green Urban from Penrith, to convert the old red phone box in Loweswater so that it now houses a defibrillator together with an emergency press-button intercom connected directly to the 999 service – hence the phone box can still be used for Fire, Police, Ambulance and Mountain Rescue call outs by the general public. In the event of a medical emergency requiring possible use of a defibrillator, then a code will be provided to the caller allowing them to access the defibrillator box itself. The unit is designed for anyone, trained or untrained, to use with full on-screen information and even a video is provided to help anyone during use. We would like to thank BT for their generous sponsorship of this particular conversion as part of a nationwide move to update as many un-commercial phone boxes as possible to new practical uses. 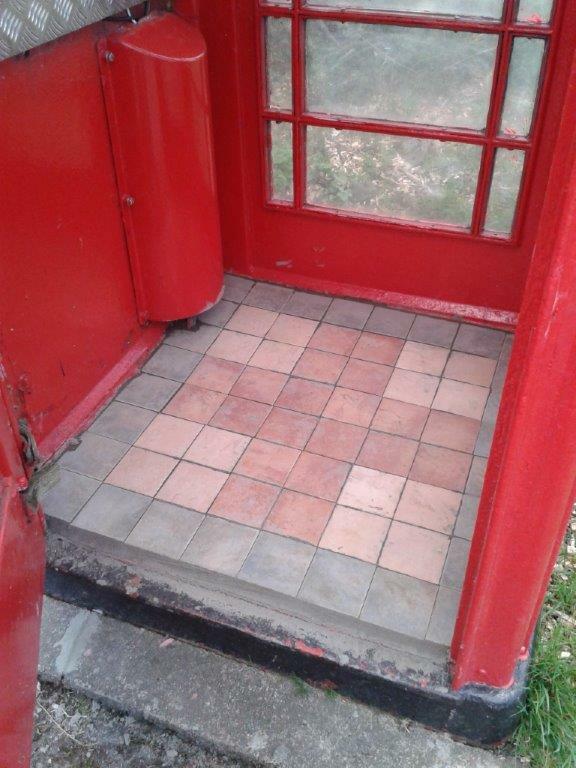 The picture above shows the remarkable tiled floor laid by Roger Hiley, one of our CFRs, who will be looking after the box (and cleaning the floor on a daily basis to maintain its pristine appearance). See more photos of the grand opening here, an article in the Times & Star and a BBC article on what’s happening to old phone boxes (including ours) across England. 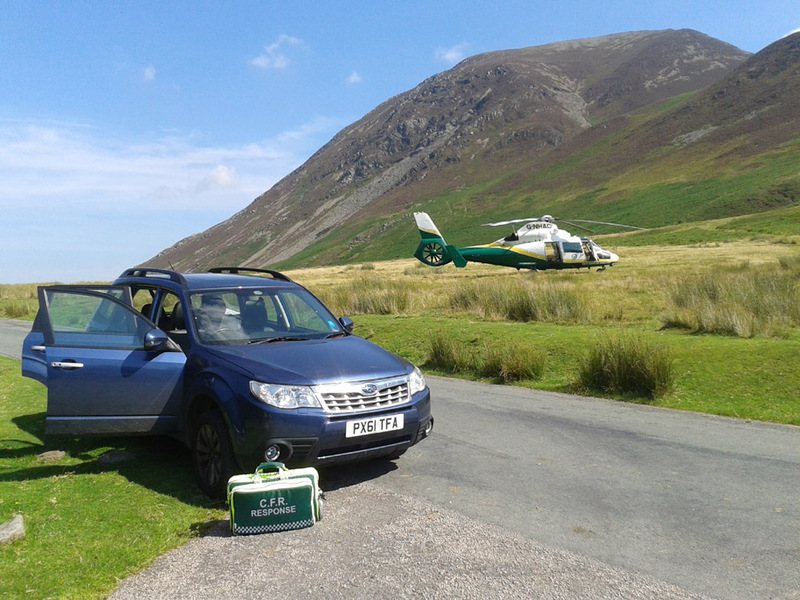 A significant number of callouts happen at the Buttermere end of the valley where we have just one active CFR at the moment. 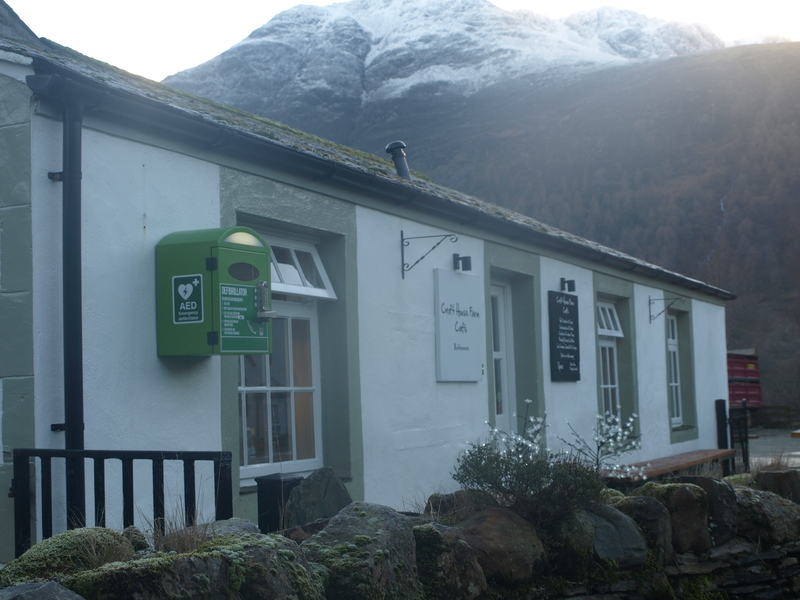 So it’s wonderful to be able to report that, thanks to the generosity of the owners of Croft House Farm Café, we have installed a public-access defibrillator at the café in Buttermere. This will be kept in a locked green box on the Café’s outside wall. The way that this system works is that, in the event of someone becoming unwell and requiring paramedic support, the first action, as always, is to telephone 999 and report the person’s condition and location to the (North West) Ambulance Service. The location of all public-access defibrillators is known to the Ambulance Service and the person phoning in can be told the location of a nearby defibrillator and its access code. The concept of public-access defibrillators is based on the premise that modern defibrillators can be used by anyone, not just by trained first responders or paramedics. Nevertheless, it is undoubtedly true that a trained person will be able to deploy the defibrillator more quickly and thus stand a better chance of saving someone’s life if they have a cardiac arrest. To this end, it is beneficial if as many as possible in the community have some familiarity of defibrillators (and cardio-pulmonary resuscitation – CPR) such as they might get by attending a British Heart Foundation Heartstart course. So, in due course, we will be providing some training on use of defibrillators and CPR to anyone in the valley who is interested. This means that they would be confident and able to help someone not only in Buttermere, but also if they came across someone requiring emergency help anywhere around the country. Just after Christmas 2012, Geoff Medd suffered a stroke whilst at home at Lanthwaite where his 8 year old daughter Lily was the only other person present at the time. She had the presence of mind to dial 999 to alert the Ambulance Service and the local team of First Responders. We were able to help Geoff prior to the ambulance arriving to take him to Whitehaven Hospital and he is now making a steady recovery. 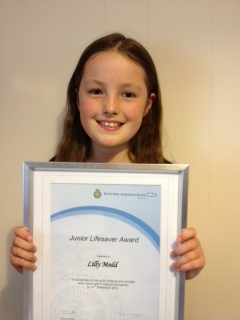 Congratulations to Lily for getting this award and her prompt action in helping her Dad at this essential first stage in the Chain of Survival (see more on this below). Her Certificate reads ”In recognition of her quick thinking and courage when faced with a medical emergency on 27th December 2012.”. In recognition of their commitment and dedicated work, all First Responders with at least 5 years service were awarded the Queen’s Diamond Jubilee Medal in 2012. So congratulations to the 15 CFRs in the local team who got medals. The local Community First Responders (CFR) team (see map for area covered) was set up in 2005 with 7 active CFRs to help people in the valley in the event of them having heart or breathing problems. First Responders are trained to help the patient in those vital minutes before a paramedic or ambulance crew arrive. All members are re-assessed annually in the use of oxygen, cardio-pulmonary resuscitation (CPR) and automated external defibillators (AEDs). More often, call-outs offer comfort and support to patients and their families at a difficult time. The equipment used to be kept in boxes strategically place throughout the area, but, in order to speed up response time to call-outs, these are now keep in the Responders’ homes. During the period since the local team has been formed, at least one member, more commonly three, have attended nearly every call-out and their skills and presence have helped many people, both residents and visitors alike. 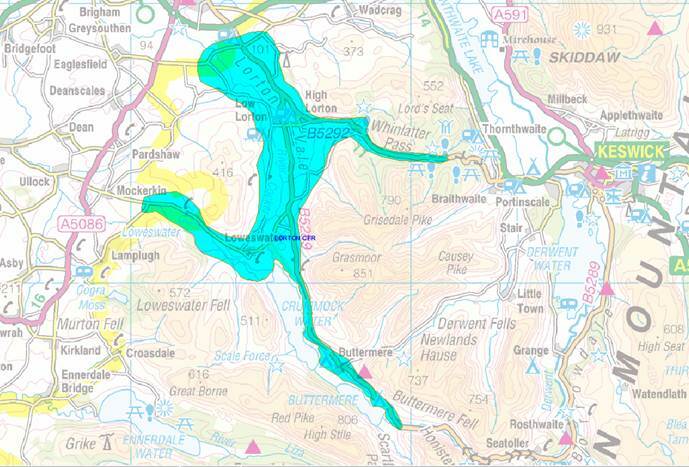 Currently there are 10 members, who live strategically throughout the Lorton, Loweswater and Buttermere areas. The Vale of Lorton team is one of 134 teams within the area covered by the North West Ambulance Service (NWAS), who provide support and back-up. Team members are paged by NWAS to attend call-outs at any time. All call-outs are supportive and strictly confidential. Treasurer – Roger Hiley; Group Trainer – Yvette Kahane. While some assistance with purchasing equipment is made by NWAS, most of our needs are supplied by our own fund raising. People living in the valley have been extremely generous as have the membership, who fund their own part in the Team by giving considerable time and also covering their own expenses. We have also been well supported by the Cumbria Soaring Club, who have twice made an award to us from their annual Lakes Charity Classic at Buttermere and several times by the proceeds from the Locals Evening held at the Kirkstile Inn. While this generosity has enabled us to equip and train to a high level, continued financial support is essential. The Team is always looking to expand its membership and are particularly keen to have younger members joining the enthusiastic team who work together to support the people living and using the Valley. Anyone interested in joining the Team should contact Leslie Webb, on 01900 85609 or email him here. A broader overview of the CFR activities in the North West of England can be found at the NWAS CFR website here. An important concept within emergency life support is the Chain of Survival. In the event of someone having a sudden cardiac arrest, the best chance of survival is for a series of things to happen as early as possible, starting with prompt recognition that something is wrong and calling an ambulance by phoning 999. This is followed, when appropriate, by Cardio-Pulmonary Resuscitation (CPR), applying an electric shock to the heart using a defibrillator and finally, treatment by experienced paramedics and others. With these objectives in mind, in 2013 the North West Ambulance Service introduced their CardiacSmart initiative to increase the number of public access defibrillators within communities and the number of people trained in basic life support skills. Phone 999 for an ambulance immediately. Please don’t contact a first responder; the ambulance switchboard will call us out if we are required and the ambulance crew and their equipment should be called as soon as possible – phoning 999 is the top priority. Access – unlock the front door so that the ambulance crew can get in and provide some lighting if after dark. Chest compressions if the patient is unresponsive and not breathing normally and if you know how to do it. – Pyjamas, dressing gown and washing stuff in a bag. – helping yourself to survive a heart attack, see PowerPoint presentation here. And finally, you can watch Vinnie Jones showing you how to do CPR here.